My husband and I have 24 nieces and nephews, with a large portion of them clustered in the middle school-high school-college range right now. Needless to say, there’s always someone graduating. This year, it’s one of our nephews who lives with us. 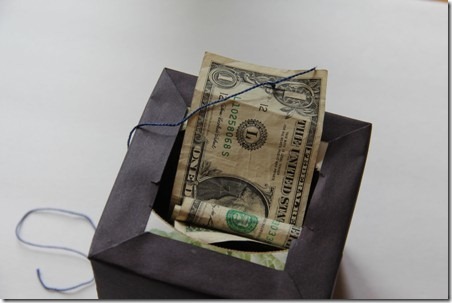 Like his cousins before him, he’s getting money, the universal “Welcome to the adult world” gift. To make this, you’ll need a square tissue box. I’m sure my family has been wondering why I left a bunch of tissues in a wad in the bathroom, but I needed crafting materials. You could also use a large yogurt container with a hole cut in the top if you prefer the round look. 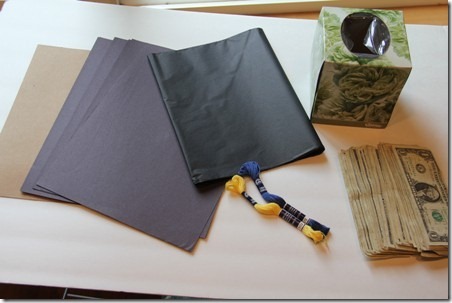 In addition to the box, gather up some black tissue paper, black construction paper, a piece of cardboard a few inches larger than the tissue box, and some embroidery floss or yarn. Oh, and of course you’ll need a stack of bills. My tissue box was gapping a bit on the sides, so I wrapped it with packaging tape. Totally optional, but it made it easier to work with. Pull the plastic out of the hole in the top. Cut the piece of cardboard so it’s a square that extends beyond the tissue box about 2” on each side. Draw a line, corner to corner, to make an X. Draw a 2” square at the center of the X and carefully cut out. Cut a square of black tissue paper larger than the hole. Tape to the back of the cardboard, covering the hole completely. Working carefully so as not to tear the tissue paper, cover the box and cardboard with the black construction paper, making sure to not cover the hole in the center. I overlapped the edge around the hole slightly to hide the cardboard. Also leave the hole on the top of the tissue box open. I used a hot glue gun, but you could use regular glue if you have more patience than I do. You can add a tag or message of some kind to the side of the box at this point if you’d like. Attach the bills end to end with tape or staples. 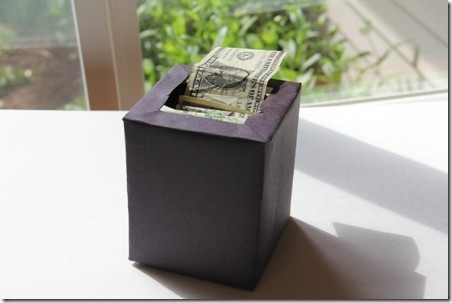 Feed the bills into the box, allowing them to stack over themselves, rather than stuffing them into the box in a glob. They’ll be less likely to catch or tear when they’re pulled out. Leave the last bill sticking out. Since money is very gross and germy (I used to work in banking), feel free to go wash your hands after this step. I’ll wait. Cut an 18” strand of embroidery floss. Attach it to the top bill. I stapled mine, then tied the floss around the staple. Push the last bill into the box. Thread the other end of the floss onto a needle. Push the needle carefully through the center of the tissue paper. Glue the cardboard to the top of the box, centering the tissue paper over the opening on the box. Make sure to avoid catching the bills or thread in the glue. 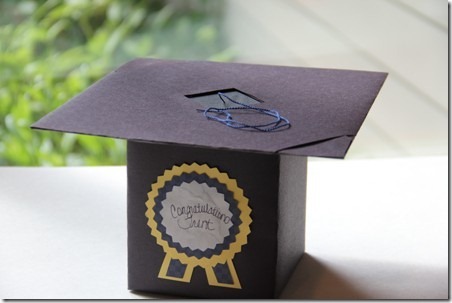 Make a tassel by laying a couple of 6 – 8” lengths of floss on top of a 2 – 2 1/2” piece of cardboard. 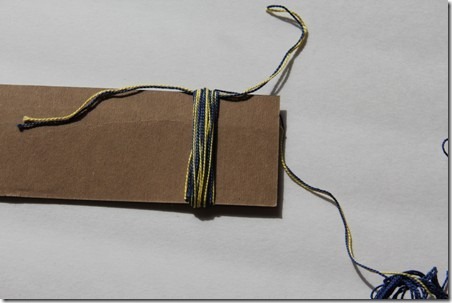 Wrap floss around the cardboard over the center of the 6” floss until the tassel is the thickness you’d like. Tie the 6” floss the the top edge. Slide the floss off the cardboard and cut the bottom ends apart. 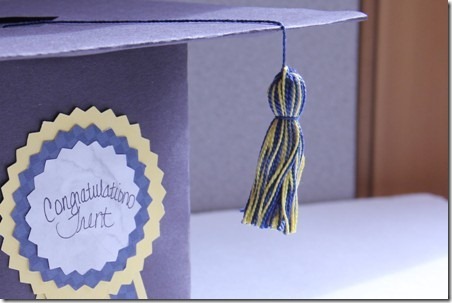 Tie the floss sticking out of the box around the tassel, leaving it long enough to just hang over the edge. Tie a small piece of floss around the whole tassel about one third of the way down to finish the shape. 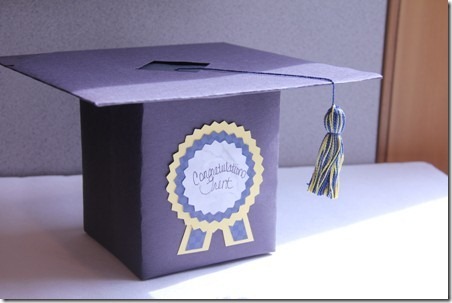 The fun part is giving it to your grad and telling them to pull the tassel until the tissue paper breaks and a string of money comes out. I’d love to show you this one in action, but it’s still in hiding until our nephew actually graduates. There’s three days of school left and he has to finish earning it, after all.